During the month of November, the restaurant chain Sweet Tomatoes (in some areas known as Souplantation) has a special, limited-time soup called chicken pot pie stew. It is my favorite of all their soups/stews. 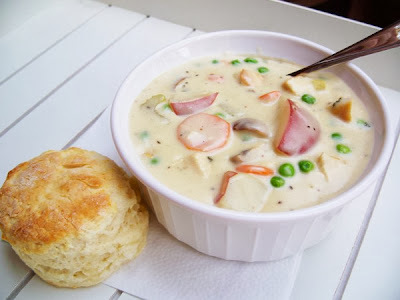 It is so creamy and delicious eaten with a biscuit. LOVE IT. I've always wanted to make something similar at home and I've tried loads of recipes, but nothing quite hit the nail on the head for me. To my surprise, I discovered the company shared the recipe on their website back in 2011! However, the posting is all jacked up and difficult to read. And once I got it deciphered, the number of steps and sheer amount of stew it made was way too much for a typical household. I was able to condense the steps and reduce the amounts and came up with something doable. It's by no means a quick and easy meal, but it's worth the work every once in a while when you get a craving. As for the biscuits, I am very happy with the recipe found here. However, I'm always interested in trying new recipes and methods and thought I'd give these "southern style" ones a try. Anyone from the south who knows their way around a biscuit will tell you to only use White Lily brand flour. Well, it's not available everywhere, and I discovered that you can get the same result by using a mix of all-purpose and cake flour. So, if you are living somewhere other than Dixie, you can use this trick to get the same fluffy biscuits. In a small pot, cover cubed potatoes with water. Bring to a boil over high heat; reduce heat, cover, and simmer for 10 minutes or until fork tender. Drain and set aside. While potatoes are cooking, heat olive oil in a large pot over med-high heat; add chicken and brown on both sides. Once chicken breasts are cooked through, remove them to a cutting board. Reduce heat to medium and add carrots, celery, mushrooms, and onions to the pot. Saute for about 10 minutes or until tender. While veggies are cooking, chop chicken into 1 inch chunks and place in a medium-sized bowl. When veggies are ready, remove them to the bowl with chicken. In the same pot, melt butter over medium heat with garlic. Whisk in flour and cook for 1 minute. Whisk in chicken broth, pepper, and salt until smooth. Heat to a low boil and simmer for 5 minutes, stirring constantly. Stir in milk and cream and simmer for another 3 minutes. 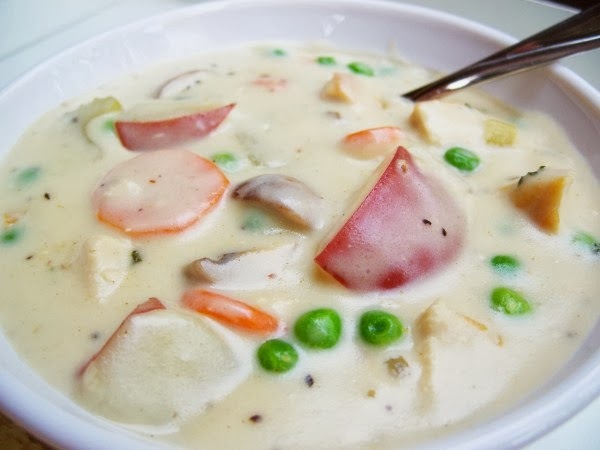 Add chicken and veggies, potatoes, peas, parsley, and thyme and simmer for 10-15 minutes. Season as needed with additional salt and pepper. Serve with biscuits. Preheat oven to 450 degrees. Combine dry ingredients in a bowl or in the bowl of a food processor. Cut the butter into chunks and cut into the flour with a pastry blender until it resembles coarse meal. If using a food processor, just pulse a few times until this consistency is achieved. Add the buttermilk and mix just until combined. If it appears on the dry side, add a bit more buttermilk. It should be very wet. Place the biscuits on a baking sheet close together for soft sides or 1" apart for "crusty" sides. Bake for 10-12 minutes or until a light golden brown on top and bottom. Makes 6-8 biscuits.